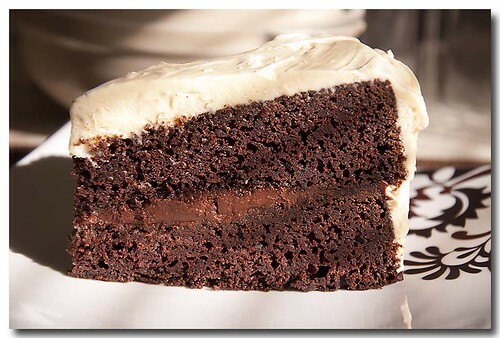 Guinness beer, Irish whiskey and Baily's Irish Cream combined with chocolate make a rich, moist, decadent cake named after the famous Carbomb drink. For the cake batter you'll need some cake flour, vanilla, buttermilk, Guinness beer, baking soda, butter, eggs, salt, baking cocoa and of course sugar. Prepare two 9-inch round cake pans. Butter the pans then line the bottom of the pans with parchment paper. Butter the parchment paper then dust the pans with either flour or cocoa powder. First you need to make the Irish whiskey ganache. You need, heavy cream, Irish whiskey and chocolate chips. 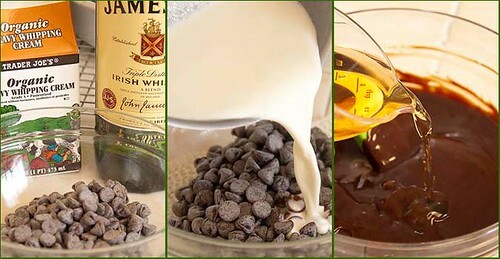 Melt the chocolate chips with hot cream, then add the Irish whisky. Refrigerate. whisking the buttermilk into the cocoa powder. Once fully incorporated whisk in the Guinness beer then set aside. Sift the cake flour with baking soda and salt. Set aside. In a separate bowl, beat the butter until fluffy. Add the sugar and vanilla, beat until fully incorporated. Add the eggs one at a time fully incorporating before adding the next egg. To the butter mixture add the cocoa-beer mixture, beat until fully incorporated. Add the sifted dry ingredients to the cocoa-butter mixture. Stir until just incorporated. Divide cake batter evenly between the two pans and bake for 30 to 35 minutes in a 350*F oven. Here's where I dropped the ball. I didn't get any photos of the making of the Baily's buttercream frosting. I have a pretty good excuse though, in the middle of all this, our cat went missing. <she's still missing :-( and I was outside crawling around on the ground, looking under and around the outbuildings for her. To assemble the cake put one cake on the cake plate, bottom side up. Spread an even layer of ganache on that. Place second layer on top of the ganache layer. 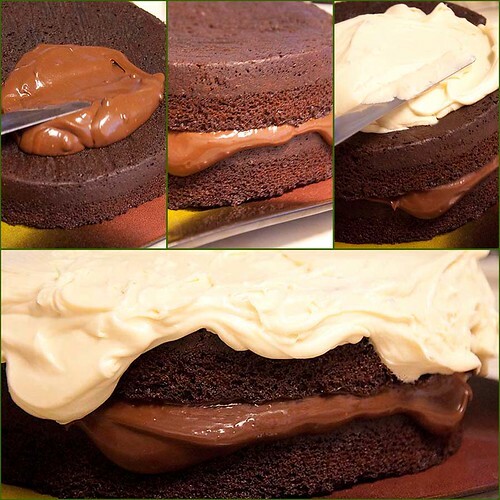 The recipe calls for the buttercream frosting to go on top and around the sides of the cake. I thought I'd get all artsy fartsy and have the ganache and frosting gently flow over the layers. Thanks to Amanda Simpson for being such a creative chef. beat until each egg is fully incorporated before adding next egg. Add cocoa mixture to butter mixture and beat until fully incorporated. and dense.) Divide cake batter evenly into prepared cake pans. center of cake comes out clean, with only a few crumbs but no batter. plate. Carefully remove parchment paper. serving dish from getting dirty during frosting process. 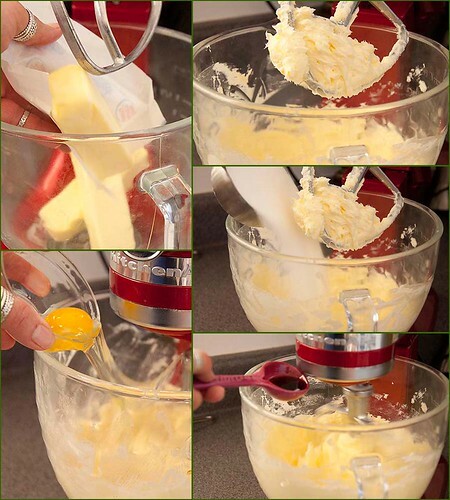 Beat all ingredients in a mixing bowl until smooth. Place chocolate chips in a heat-proof bowl.